21 May, 2011 21:21 | Dish It Out! 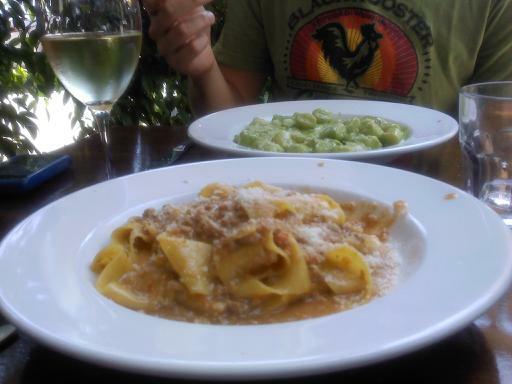 Saturday in the park w/ Mick; La Cava on Ventura in Sherman Oaks. Calamari Misto w/ zuke, shared a green salad lemon vingrette garbonzos chicken and nice provolone. Light, lovely gnocchi in pesto cream. Pappardalle in veal ragout with shaved parmesan. Do we really have to work?? Posted on May 21, 2011 by tonyspats	• This entry was posted in Uncategorized. Bookmark the permalink.